Before Monday’s Liberty Township Board of Trustees meeting, the grassroots organization Save Our Services (SOS) were taking signatures from township residents for a petition of “removal for cause.” The group is seeking the removal of trustees Melanie Leneghan and Michael Gemperline for a list of causes listed in their petition. Libby Wallick, left, asked longtime resident Larry Coolidge, right, to sign the petition as he walked into the township hall. 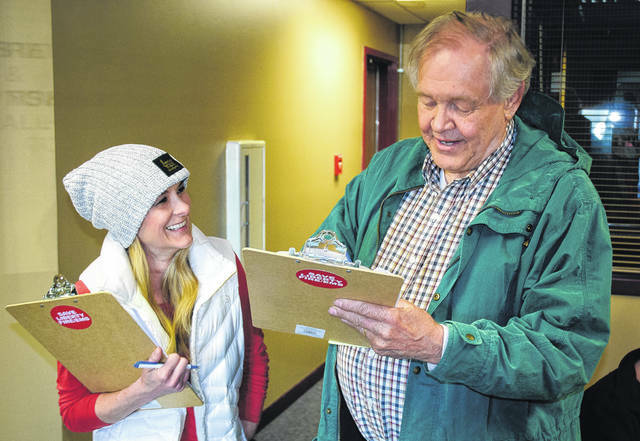 Standing in the foyer of the Liberty Township Hall Monday evening, several members of the grassroots organization Save Our Services (SOS) were asking residents to sign a petition for “removal for cause” of Liberty Township trustees Melanie Leneghan and Michael Gemperline. Seeming upset, Gemperline said before the trustees meeting that what the grassroots organization was seeking wasn’t possible, because he had talked with both the county prosecutor’s office and the Delaware County Board of Elections, both stating there was no such thing as a recall petition. The Save Our Services group was organized in October to lobby against trustees turning over control of the township’s emergency medical services (EMS) to Delaware County EMS. However, a township resolution remains tabled that would dissolve the township’s EMS and forcing the county — by law — to provide the township with the county-operated EMS. In other business, the trustees were to hear from Scott Belcastro, the principal owner of Trebel, LLC (a certified aggregator with the Public Utilities Commission of Ohio (PUCO), on the township’s natural gas aggregation, but without notice, the representatives of Trebel failed to show for the regularly scheduled meeting. Cathy Buehrer, the township’s administrative assistant, said she had received the 19-page resolution at 3 p.m. Monday, which was sent on to the prosecutor’s office. Since it was late in the day, the assistant prosecutor could not look it over. Leneghan made a motion to approve the resolution. During the trustees’ April 1 meeting, at the insistence of Belcastro, trustees voted 2-1 in favor of authorizing the township administrator to sign an agreement for electric power aggregation once the supplier bids were received by Trebel LLC on April 8. “I’m not comfortable with the agreement,” Eichhorn said at that time, but since then has said she was now much more comfortable with the electric aggregation contract but still didn’t like the way things had been handled. Monday evening, the trustees also approved a resolution authorizing the county prosecutor’s office to negotiate and/or clarify the contract terms with Trebel for the approved electric power aggregation contract. Gemperline said his understanding of the natural gas aggregation resolution was that it was a template used in other townships for similar programs. He said the prosecutor’s office has seen and approved the same template for the other townships. With that said, Leneghan moved forward with a motion to vote on the resolution. Both Leneghan and Gemperline voted yes with Eichhorn voting no. Trustees approved a resolution in July 2018 engaging Trebel LLC in an energy consultation and management agreement. This entry was tagged D. Anthony Botkin, Liberty Township, Melanie Leneghan, Michael Gemperline, Scott Belcastro, Shyra Eichhorn, Trebel LLC. Bookmark the permalink.